For plucked strings, String Studio VS-2 is the daddy, particularly with its effects, but it's limited and expensive for what it is. Does excellent plucked strings. New effects section is a bonus. 64-bit compatibility. Limited sonic palette. Not great value for money. No initialise patch option. A lot of panels to flick through. In our review of the original Applied Acoustics Systems String Studio way back in 2007, we praised its great-sounding physical modelling synthesis but felt that its limited range of sounds would have users quickly tiring of its charms. 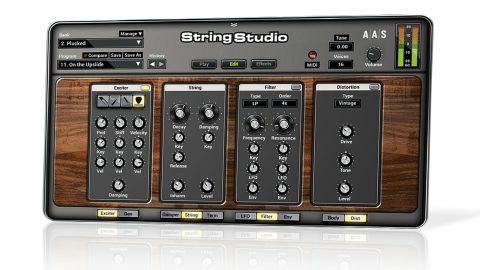 Although the new version, String Studio VS-2 (VST/AU/AAX/standalone), includes a wealth of new features, it's based on the same combo of physical modelling and subtractive synthesis as its predecessor. "String Studio generates its tones by simulating the vibration of a string"
Rather than using sample playback or a traditional oscillator, String Studio generates its tones by simulating the vibration of a string, the object used to play it (the exciter) and the resonant body to which it's attached. The Exciter panel offers a choice of four exciter models: Pluck, Bow and two Hammers. Each features a couple of custom parameters to play with and modulate (Pluck's Force and Friction, for example, and both Hammers' Mass and Stiff), and the initial sound can be further modified in the String, Damping, Termination and Geometry panels. The manual covers these in a fair amount of theoretical detail, but the best way to get an idea of the sounds that can be created is to simply dive in and experiment. Next, the signal is fed through a filter, complete with dedicated LFO and envelope for modulating its cutoff Frequency and Resonance. The filter is pretty versatile, with low-pass, high-pass, band-pass, notch and two formant types onboard, and 12dB and 24dB/octave slopes. After the filter comes the Body module, where you choose one of four body types (Piano, Guitar, Violin and Generic), set it to one of five sizes (from Tiny to Huge) and adjust its Decay, as well as dialling in high- and low-pass filters and wet/dry Mix level. Last but not least, the Distortion section features six simple distortion models and is supplemented by a new improved effects section (see Level best). Aside from the new effects, other improvements include a redesigned interface, an expanded library of presets, a new bank and program manager, microtonal tuning via Scala scale files, and 64-bit AAX, AU and VST compatibility. While the new interface is easier on the eye, its larger knobs mean that the various synthesis sections are split over multiple panels, rather than all living on the same page. The presets do a good job of showing off what the instrument is capable of, but they also serve to highlight its major weakness: despite the enhancements to its effects section, String Studio still has a decidedly limited sonic palette. It's certainly technically impressive, but once you get past how good the pluck model sounds, it becomes apparent that the synth is a one-trick pony that you're unlikely to use that often. While the single note plucks are authentic, it can't really handle hammer sounds like piano or strums convincingly. For a monophonic plucked guitar sound it's excellent, but for, say, a marcato string patch, even good ol' Sylenth 1 beats it. Speaking of which, with String Studio in a similar price bracket to much more flexible instruments like KV331 Audio's SynthMaster, NI's FM8 and LennarDigital's Sylenth1, it's hard to recommend it to anyone other than ardent physical modelling aficionados or the very rich. Fans of the original will find this update solid if unspectacular, though, and will no doubt welcome its new-found 64-bit compatibility.